The Stratasys J750 provides both manufacturers and designers with unrivalled product realism and the highest aesthetic performance available on the market. Allowing for printing in 360,000+ colours, users can also blend up to 6 different materials, supporting the use of translucent or block-colour models and offering a choice of flexibility or rigidity material properties adjustment. With full colour capability as well as texture mapping and colour gradients the possibilities are limitless. The J750’s unparalleled realism offers the ultimate advantage to its users- prototyping models that have a realistic feel. Here are the ‘Top 4 Uses of the Stratasys J750 in 2016’, brought to you by SYS Systems. From New York Fashion Week dresses to prototyping within global high-fashion brands, 3D printing is making its mark on the fashion industry with the new Stratasys J750. Because of its full-colour capability and precision, the J750 offers limitless creative potential within the fashion world. The ability to implement multi-coloured designs has only been recently introduced to this market, and since doing so it has added an entirely new dimension to fashion. Iconic eyewear manufacturer, Safilo, is one of the world’s largest suppliers of eyewear to luxury brands such as Dior, Fendi, Jimmy Choo and Hugo Boss, alongside five of the company’s own brands including Carrera, Polaroid and Safilo itself. Due to the nature of the fashion industry, Safilo needed a faster method of response to ever-changing market trends and demands. Their solution? The Stratasys J750. 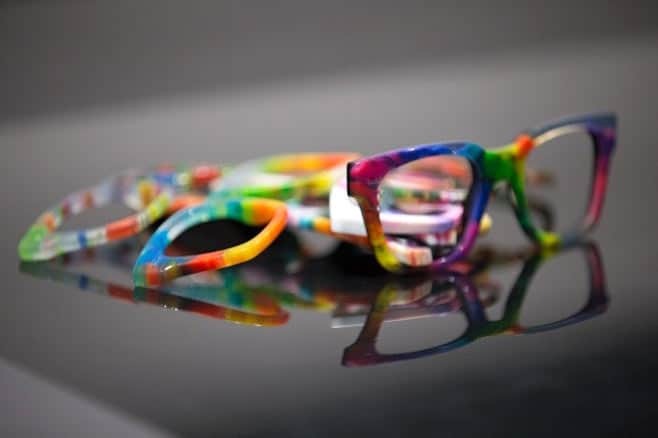 Safilo have harnessed the use of rapid prototyping with 3D printing, iterating their eyewear frame designs faster and in more colours than ever before through the adoption of the J750. Utilising the printer’s large build tray has allowed the company to produce a number of frame variations in a single batch. Thus increasing throughput whilst also reducing developmental costs through the efficient production of full-colour prototypes with the ability to alter texture and intricate patterns built directly into the plastic in a fraction of the time previously spent on frame iterations. The Stratasys J750 has allowed Safilo to reduce their prototyping cycle from 15 hours to just three, reducing the company’s development process turnaround time by an enormous 60% and allowing them to accelerate product time-to-market as well as maintain their competitive edge, keeping one step ahead of the market demand. 3D printing is making its mark in the film industry as well with this year’s September release of Kubo and the Two Strings stop animation epic by LAIKA Studios. LAIKA Studios has made a successful and serious venture into stop animation by implementing Stratasys 3D printing technology. Using this advanced technology in all of their previous stop animation productions such as ParaNorman, Coraline and The Boxtrolls, LAIKA’s creative capabilities have evolved enormously. In 2009, Coraline had 207,000 possible facial expressions, while Norman, from 2012’s ParaNorman had 1.4 million possible expressions. But with Kubo, LAIKA were able to produce over 48 million possible facial expressions with the use of the Stratasys J750. Similarly Sainsbury’s introduced the same technology to its 2016 Christmas Advert where a number of stop motion animated characters were brought to life using the J750. This three-and-a-half minute mini-film advert utilises the J750’s colour capability, creating a colourful example of the world’s only full-colour, multi-material 3D printer. Using the J750 3D printer, the team was able to produce hundreds of 3D-printed face masks over a three month period, allowing the team to produce facial models using an extensive range of colours and mixture of materials. Taking inspiration from productions such as ParaNorman and the recently-released epic stop-motion film, Kubo and the Two Strings, the project was able to achieve full colour and detailing like no other with the J750’s limitless capabilities, offering an incredible array of colour to bring Sainsbury’s Christmas story to life. Israel-based product development company, Synergy, is always seeking new ways to innovate their designs during the product iteration process. Their customers rely solely on Synergy’s ability to transform bright ideas into marketable products that are also viable in the manufacturing process. The team at their Netanya site often work around the clock designing and engineering the smallest details in order to perfect the design. This can include anything from perfecting the grip on a medical device to improving the appearance of a phone charger to suit the target consumer. Design iterations are often discarded or embraced based on their look and feel during the prototyping phase. To help in that vital decision making, Synergy invested in a Stratasys J750 3D printer for their in-house iteration processes. With this advanced technology Synergy are able to reproduce a realistic model of the end product, mimicking the final materials and making it as lifelike as possible. So much so that when the company redesigned an emergency response system keypad for the after-market automotive industry, the J750 was able to play a crucial role in producing multiple designs for the panel. Mounting above the rear-view mirror, this device had to be extensively tested to ensure its shape would fit the car’s interior, as well as pass mechanical and ergonomic testing. The iterations each included soft-touch buttons, backlighting, graphics, housing and internal connections to the electronic panel. The ability to recreate all of these materials exactly as they would be in the final product enables Synergy to create, innovate and improve their customer’s designs, ensuring they always come back to Synergy for future projects. Now, realistic examples of human anatomy can be recreated using 3D printing technology. The J750 has allowed for surgeons to replicate patient organs for vigorous pre-surgery planning, and it has also helped in the training of the surgeons of our future- enabling them to physically interact with a full range of complexity in human pathology through 3D printed examples of patient conditions. The Stratasys J750 can produce material textures as soft as tissue and as hard as bone, enabling an unparalleled ability to recreate human anatomy to as a way to simulate surgery for clinical training. This process also allows for surgeons to plan the best way to perform patient surgery through generating 3D printed models of patient organs and their illness. To do this patient scans are practically 3D printed so that they produce patient-specific models. Biomedical Modeling Inc. (BMI) are always in search of ways to improve surgical planning and patient care. So they sought a solution for planning complex surgical procedures whilst reducing patient treatment time. With the J750, BMI were able to create an exact replica of a human heart using photographs of operations and cadavers to guide the segmentation process. Quick modification of the original solid heart design allowed for the model to be split into two so that trainees could open it and view internal chambers, valves, and papillary muscles. Another model made using BMI’s Stratasys J750 is the cross-section head model, used for technical demonstrations and in anatomical education. Utilising the same materials as were used to create the heart model, the head and brain cross-section demonstrates a more vibrant piece, whereas the heart represents colour realism. In the head cross-section brighter colours have been used to highlight the various biological tissues alongside transparent material which has been integrated to reveal internal structures as well as tissues. BMI also produced a hand model in a similar fashion, proving more realistic colour representation, the model combines realism with the same transparent material as used in the head and brain cross-section. Using a transparent and flexible material atop the model’s skin layer creates a realistic texture which reveals the critical structures within the hand.